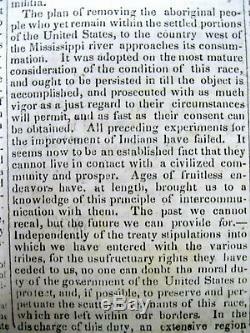 1835 newspaper PRESIDENT ANDREW JACKSON speech on the Cherokee Indian Removal Policy resulting in the TRAIL OF TEARS - inv # 4Q-119. 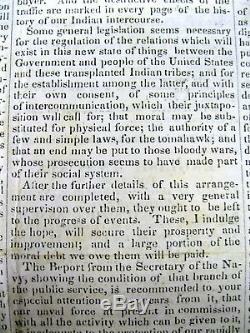 SEE PHOTO----- COMPLETE, ORIGINAL NEWSPAPER, the Lowell Journal (MA) dated Dec 11, 1835. 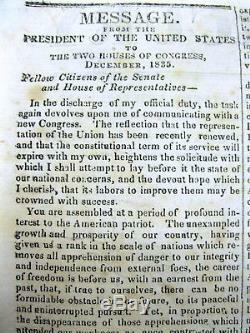 This newspaper contains an inside, 2 page complete printing of President ANDEW JACKSON's State of the Union Address for 1835. Jackson articulates the US Federal Government's INDIAN REMOVAL POLICY that led to the TRAIL OF TEARS forced migration of the Cherokee Indians from the Southwest US to Oklahoma Territory. 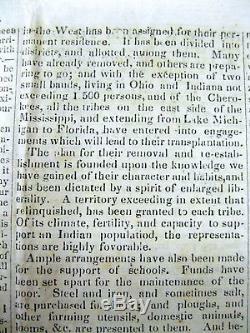 Interesting contemporary reporting of the INDIAN REMOVAL POLICY of Andew Jackson. 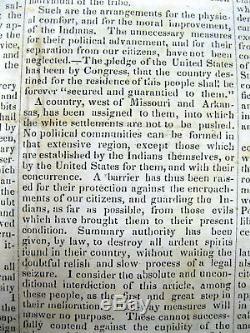 The Indian Removal Act was signed by President Andrew Jackson on May 28, 1830. The act enjoyed strong support from the non-Indian peoples of the South, but there was a large amount of resistance from the Indian tribes. Cherokee tribes came together as an independent nation to stop this relocation, but they were unsuccessful. On April 24, 1830, the Senate passed the Indian Removal Act by a vote of 28 to 19. 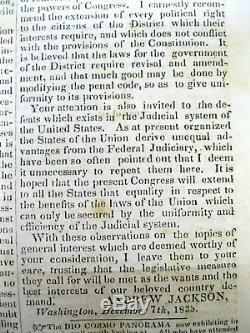 On May 26, 1830, the House of Representatives passed the Act by a vote of 101 to 97. On May 28, 1830, the Indian Removal Act was signed into law by President Andrew Jackson. The Trail of Tears was a series of forced removals of Native American nations from their ancestral homelands in the Southeastern United States to an area west of the Mississippi River that had been designated as Indian Territory. The forced relocations were carried out by various government authorities following the passage of the Indian Removal Act in 1830. The relocated people suffered from exposure, disease, and starvation while en route, and more than four thousand died before reaching their various destinations. The removal included members of the Cherokee, Muscogee (Creek), Seminole, Chickasaw, and Choctaw nations. The phrase "Trail of Tears" originated from a description of the removal of the Cherokee Nation in 1838. Between 1830 and 1850, the Chickasaw, Choctaw, Creek, Seminole, and Cherokee people (including mixed-race and black freedmen and slaves who lived among them) were forcibly removed from their traditional lands in the Southeastern United States, and relocated farther west. Those Native Americans that were relocated were forced to march to their destinations by state and local militias. The Cherokee removal in 1838 (the last forced removal east of the Mississippi) was brought on by the discovery of gold near Dahlonega, Georgia in 1828, resulting in the Georgia Gold Rush. Approximately 2,000-6,000 of the 16,543 relocated Cherokee perished along the way. This listing includes the complete entire original newspaper, NOT just a clipping or a page of it. 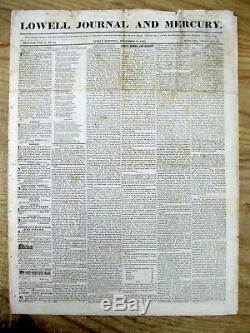 Every item we sell is an original newspaper printed on the date indicated at the beginning of its description. This is truly SIX CENTURIES OF HISTORY that YOU CAN OWN! Goldman is a consultant to the Freedom Forum Newseum and a member of the American Antiquarian Society. Let our 45+ years of experience work for YOU! We have hundreds of thousands of historical newspapers (and their very early precursers) for sale. The item "1835 newspaper ANDR JACKSON Cherokee Indian Removal Policy speech TRAIL OF TEARS" is in sale since Monday, October 2, 2017. This item is in the category "Collectibles\Paper\Newspapers\Pre-1900". The seller is "qrst" and is located in Oxford, Maryland. This item can be shipped worldwide.